This ravioli casserole reminds me of lasagna. Cheese ravioli are layered with a meat sauce and mozzarella and parmesan cheese in a casserole dish and then baked in the oven. 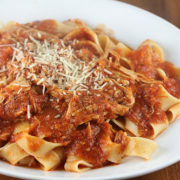 The meat sauce is homemade and gets a lot of its flavor from Italian sausage. You can use your favorite brand of ravioli for this recipe. If you are looking for an easy meal, this casserole is easy to prepare and the only real work that is required is preparing the sauce. Serve with garlic bread. Enjoy. I have never cooked with wine so could you suggest what red wine I should buy to use in this recipe please? Sorry for the late reply. I am not an expert on wine but I wouldn’t recommend anything expensive for cooking, California Cabernet should work well.